This March Newsletter focuses on the messaging that is being shared by elected officials about the economic importance of the Ports-to-Plains Corridor. U.S. Representative Jodey Arrington (TX-Lubbock) provided a clear description to the U.S. House of Representatives Committee on Ways and Means about the economic value to the rest of the country by expanding the corridor. Mayor Brenda Gunter provided a strong argument for expansion of the corridor from a local and national perspective to the City of San Angelo Council as the council considered a resolution supporting the designation as future interstate 27 through San Angelo. Please take a few minutes to view the videos by both these elected officials. 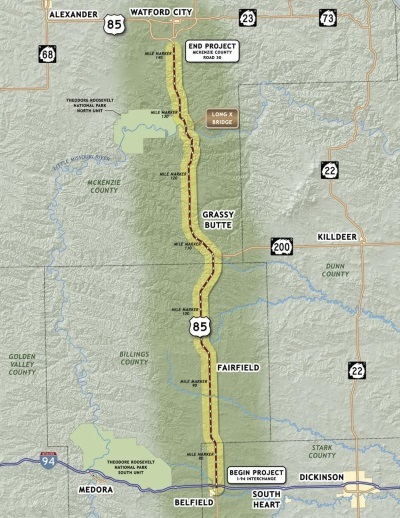 With the approval of the Final Environmental Impact Statement for the U.S. 85 corridor on the Theodore Roosevelt Expressway, it clears the way to begin construction on the four-lane expansion on a 62-mile segment between Watford City and Interstate 94 at Belfield in North Dakota. The Alliance has been reaching out to local governments and organizations in Texas to consider a resolution supporting the designation of the extension of Interstate 27 as a future interstate in Texas. Having local support for the designation is critical. The Alliance hopes that your organization has either approved or scheduled consideration of this resolution. Download Proposed Resolution. The Texas State Legislature decided not to meet on Thursday, March 7th, so the Interstate 27 Legislative Day that was scheduled for March 7th was cancelled. The Ports-to-Plains Alliance is evaluating the potential of rescheduling this day, but with the Washington DC Fly-in coming up, no decision has been made. Thank you to all that had committed to participate. Your support is appreciated. WASHINGTON -- March 7, 2019 – This week, Congressman Jodey Arlington (TX-19) participated in a House Ways and Means Committee hearing on the state of America’s infrastructure. At the hearing, Congressman Arrington highlighted the need for infrastructure to sustain rural communities and bring critical agriculture and energy products to market. “I represent 29 rural counties in West Texas and if we don’t have sustainable communities, we won’t have vibrant ag and energy and if we don’t have vibrant ag and energy, we will not have the energy dominance and independence that is of national security importance, neither will we have food security, which is of equal national security importance,” said Arrington. “My responsibility representing rural America is to ensure that they are a priority because they don’t have the tax base, they don’t have the people, but their product is precious. We need to make sure we have a system that can efficiently move that product to feed and clothe the American people and to export markets. Congressman Jodey Arrington is a member of the U.S. House of Representatives serving the Nineteenth Congressional District of Texas. He serves as a member of the House Ways and Means Committee. Mayor Brenda Gunter provides a clear overview of the benefits of expanding Interstate 27 along the Ports-to-Plains Corridor between Lubbock and Laredo. San Angelo, TX - San Angelo Mayor Brenda Gunter presented the potential benefits of expanding and improving interstate transportation routes to city council. Following that, the council voted unanimously in favor of working with TXDoT to bring about the project. "Well I-27, or what we have also referred to as the Ports to Plains corridor, is an important corridor," said Gunter. "That's because, out here in West Texas, we produce all the food -fiber- and fuel for a lot of the United States. As well as internationally. So the faster, quicker, and safer we can get product to market - the better it is and the less expensive it is." According to their website, the Ports-to-Plains Alliance is a group of communities and businesses whose purpose is to advocate for new, expanded and improved transportation infrastructure throughout North America. They place special interest on bringing the energy and agricultural goods from the U.S. heartland and southwest region to ports in Mexico to Canada. A delegation of 23 participants from across the nine-state region will be in Washington DC holding congressional office meetings on April 2-4, 2019. Appointments will be made with as many senate and house offices across the nine-state region as we can schedule. We are asking to meet with the Senator or Representative and the appropriate staffer that deals with transportation. The Ports-to-Plains Alliance has joined the Rebuild Rural Infrastructure Coalition comprised of more than 240 organizations from across the country focused on rural communities, U.S. agricultural producers, rural businesses, and rural families. The Rebuild Rural Coalition is dedicated to advocating for investment in rural America's infrastructure and understands that rural Ameri­ca's infrastructure needs are fundamentally different. The Farm Credit Council helped form the Rebuild Rural Coalition because past infrastructure initiatives often focused on urban and suburban areas while not adequately addressing the unique needs of rural areas. Rural communities have seen their infrastructure deteriorate, jeopardizing their jobs, their families' health and well-being and their competitiveness in both agricultural and other industries important to rural America. On February 5, 2019, the Rebuild Rural Coalition sent a letter to congressional leadership with the following lead message: "As you set the strategic goals for the new Congress, the Rebuild Rural Coalition strongly encourages you to move quickly to pass bipartisan legislation to strengthen our nation’s infrastructure, including specific provisions focused on the unique needs of rural communities and agriculture." Click here to download the complete letter. Transportation is one of several infrastructure types that are targeted by the Rebuild Rural Coalition. Click here to download the Transportation Fact Sheet. The North Dakota Department of Transportation, together with the Federal Highway Administration, announced on Wednesday, March 13th the completion of the Final Environmental Impact Statement for the U.S. Highway 85 project on the Theodore Roosevelt Expressway. The Final EIS gives final environmental clearances to replace the Long-X Bridge and construct a four-lane highway on U.S. 85 (Theodore Roosevelt Expressway) for 62 miles between Watford City and Interstate 94 at Belfield. BISMARCK (Minot Daily News) — The North Dakota Department of Transportation together with the Federal Highway Administration announced on Wednesday the completion of the Final Environmental Impact Statement for the U.S. Highway 85 project. The project includes replacing and constructing a four-lane Long X Bridge about 16 miles south of Watford City and four-laning 62 miles of U.S. Highway 85 from the Interstate 94 interchange to the Watford City Bypass (McKenzie County Road 30), according to a NDDOT news release. NDDOT, along with consulting partner KLJ Engineering, and FHWA worked as the lead agencies for three and a half years with the National Park Service, U.S. Forest Service, U.S. Army Corps of Engineers, along with 17 participating stakeholder groups to complete the first phase in development of this project. The environmental impact process included extensive public outreach, encompassing three rounds of public meetings and the consideration of numerous public and stakeholder comments. The completion of the final EIS is a significant milestone in the development of the project. The next phase is the construction of the Long X Bridge, which is scheduled to be bid this spring. Construction on the remainder of the U.S. 85 project has not been determined and funding has not been identified. Click here to access final EIS documents.